Fort Flagler on the Beach by the Lighthouse. Fishing from the beach at the Fort Flagler lighthouse has been a Washington favorite for years. Runs of Chinook, Coho, Pinks, and Chum salmon all feed in the pass through the area before they moving on to the spawning grounds. Flagler offers excellent opportunities for Summer run Chinook, fall Coho and Pinks and winter Chum. Herring is the best bet but buzz bombs or point Wilson Darts have proven effective over the years. 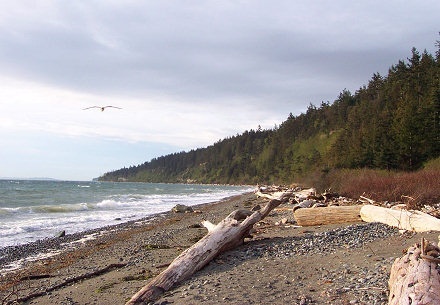 Fort Flagler also offers camping and other amenities such as a little convenience store on the beach opposite of the lighthouse. This location opens up from July till November and then again Jan to April for Salmon fishing. Become a member of Lunkersguide.com to view our Lunker location map to Fort Flagler lighthouse.